Stelstocks is a steel stockholder specialising in the supply of high quality steels to the turned parts and component manufacturing industries. Extensive stocks are held at our West Midlands warehouse and delivered daily to users in the Midlands and nationwide. We hold ISO 9001 accreditation plus national approvals from major motor, commercial and agricultural vehicle manufacturers, also O.E. supplies in the coupling, connector and fluid power sectors. As an independent company not assigned to any major group, we have the ability to purchase widely from major European producers with the resulting safeguards to continuity of supply, price competitiveness and stability and material quality. Comprehensive stocks of rolled, drawn, turned and ground bars are held in carbon and alloy specifications to UK and Euronorm standards. 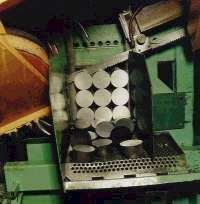 Free machining grades in rounds and hexagons are produced through high integrity process routes including crack detection by surface and ultrasonic methods, and to a high standard of surface finish, straightness and bar end preparation. Associated services include sawing to length, non-destructive crack detection and certification, special bar facing and chamfering, and hexagon roller marking. We offer guaranteed reliability from stock for your one-off panic orders or just-in-time schedule requirements.